You will find below the horoscope of Kate Upton with her interactive chart, an excerpt of her astrological portrait and her planetary dominants. Horoscopes having the same aspect Venus trine Saturn (orb 1°03'): Leonardo DiCaprio, Marine Le Pen, Halle Berry, Khloe Kardashian, Tina Turner, Dave Gahan, Yannick Noah, Manuel Valls, Ricky Martin, Sarah Michelle Gellar, Joan of Arc, Vivien Leigh... Find all the celebrities having this aspect. Horoscopes having the same aspect Moon opposite Mars (orb 1°05'): Shakira, Bill Gates, Robbie Williams, Joan Baez, Reese Witherspoon, Pascal Obispo, Theodore Roosevelt, Heather Locklear, Louis Armstrong, Richard Dean Anderson, Daniel Auteuil, Wallis Simpson... Find all the celebrities having this aspect. Celebrities born the same day: Elizabeth Hurley, Judy Garland, Philip Mountbatten, Theresa Caputo, Chantal Goya, Leelee Sobieski, Carlo Ancelotti, Vincent Pérez, Princess Madeleine, Duchess of Hälsingland and Gästrikland, Gina Gershon, Gustave Courbet, Shane West... List of all the celebrities born on June 10. Celebrities clicked on in real-time: 576,218,670 times. Kate Upton (born June 10, 1992 in St. Joseph, Michigan (birth time source: Sy Scholfield, from a birth notice "Mercy-Memorial BIRTHS," The Herald-Palladium (Saint Joseph, Michigan), 11 June 1992, p. 7.)) is an American model known for her appearance in the 2011 Sports Illustrated Swimsuit Issue, for which she was named "Rookie of the Year." Upton was born in St. Joseph, Michigan and raised in Melbourne, Florida. She has three siblings and her uncle is Fred Upton, the U.S. Representative for Michigan's 6th congressional district. An avid horseback rider, she showed for the American Paint Horse Association and competed on a national level. With her horse "Roanie Pony," she won three APHA Reserve World Championships, in 13 and Under Western Riding, 13 and Under Horsemanship and 14-18 Western Riding and named the 13 and Under Reserve All-Around Champion at the APHA World Championship Show giving her a total of five championships. Here are some character traits from Kate Upton's birth chart. This description is far from being comprehensive but it can shed light on his/her personality, which is still interesting for professional astrologers or astrology lovers. 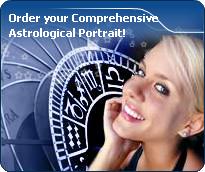 In a matter of minutes, you can get at your email address your astrological portrait (approximately 32 pages), a much more comprehensive report than this portrait of Kate Upton. Kate Upton, the diurnal South-western quadrant, consisting of the 7th, 8th and 9th houses, prevails in your chart: this sector brings about a thirst for communication and sometimes, a need to take risks in your dealings with others. Relations are a factor of your evolution and your transformation, which you accept serenely. Indeed, what matters to you is the movement and the energy that link you to others and that make you gain more awareness. A kind of rebellion or a desire to get away from it all is rooted in you. Cheers for communication and mobility, Kate Upton! The predominance of Air signs in your chart favours and amplifies your taste for relations and for all kinds of short trips, whether real (travels) or symbolic (new ideas, mind speculations). You gain in flexibility and adaptability what you lose in self-assertion or in pragmatism. The predominance of Water signs indicates high sensitivity and elevation through feelings, Kate Upton. Your heart and your emotions are your driving forces, and you can't do anything on Earth if you don't feel a strong affective charge (as a matter of fact, the word "feeling" is essential in your psychology). You need to love in order to understand, and to feel in order to take action, to the detriment of a certain vulnerability against which you should learn to fight. Kate Upton, the Cardinal mode is dominant here and indicates a predisposition to action, and more exactly, to impulsion and to undertake: you are very keen to implement the plans you have in mind, to get things going and to create them. This is the most important aspect that inspires enthusiasm and adrenalin in you, without which you can grow weary rapidly. You are individualistic (maybe too much?) and assertive. You let others strengthen and improve the constructions which you built with fervour. Your angular houses, namely, the 1st, 4th, 7th and 10th houses, are very emphasized in your chart, Kate Upton: according to the Tradition, they are the strongest and most dynamic houses. Should the rest of your chart concur, angular houses suggest that you are an enterprising, energetic and assertive woman. Indeed, angular houses are said to generate impulsions and to give a powerful and domineering personality. After this paragraph about dominant planets, of Kate Upton, here are the character traits that you must read more carefully than the previous texts since they are very specific: the texts about dominant planets only give background information about the personality and remain quite general: they emphasize or, on the contrary, mitigate different particularities or facets of a personality. A human being is a complex whole and only bodies of texts can attempt to successfully figure out all the finer points. You are sensitive to beauty, Kate Upton, and your emotional reactions are often of an aesthetical order because, even in the appearances, balance and harmony are necessary for your well being. You easily identify with others, you have a talent for emphasizing their best qualities and you solve their problems with tact and diplomacy. You endlessly weigh the pros and the cons and you constantly try to please your interlocutors. In doing so, you may develop a strong dependency because you need their approval too much. It is difficult for you and your entourage to deal with your indecisiveness because it inclines you towards contemplation more than towards creation and you are tempted to procrastinate unless you try to charm others into doing things for you. But as long as harmony prevails... isn't it what matters? Your intelligence is sensitive and delicate, with good comprehension abilities, Kate Upton, which endows you with a strong intuition and receptivity. To you, impressions and feelings prevail over facts and your excellent selective memory is not cluttered with useless elements. Although you are not aware, your fertile imagination may lead you to change your daily reality so that it matches your dreams better. If you are creative, you may make use of your imagination in literary pursuits where you can freely invent beautiful stories taking place in the past. Your passion for History is such that you may immerse yourself into it with too much nostalgia and therefore, you may miss opportunities the present offers to design projects and to think of the future. What is it, that really appeals to you, Kate Upton, to love or to please? You have so much charm and so much volubility that you easily manage to be what is known as a femme fatale. Feelings and intellect are so tightly mingled that you may not know any more whether you are really in love or whether you are acting. You have a taste for flirt and variety, and you appreciate very much complicated situations where no one knows where the truth lies any more. You shift from one game to another. To you, everything can be an agent for seduction, be it your attitudes, your words or the way you dress. You do not separate your actions from your desire to please. People who do not understand this are in trouble because, if they take your sweet and well-phrased speeches too literally, they are likely to undergo cruel disappointments: for you, it is only a matter of living in the moment and you never commit yourself because, above all, you loathe confinement, even just its thought. Impulsive, impatient, quick and energetic? You? Yes of course, Kate Upton. You are courageous and able to make intense and huge efforts for a short while; and what a terrific rhythm! In sport, of course, or in your sexuality, you are not the type who ponders, you take action instinctively, “in a rough and ready way”. You are outspoken, you do not worry about other people's opinion and you do not allow them to slow you down or to judge you. You must succeed or fall apart. You cannot be bothered with diplomacy or with compromises. You are too straightforward and unyielding to waste time with finesse or shrewdness. This is what makes you charming because, with you, one always knows where one stands. This text is only an excerpt from of Kate Upton's portrait. We hope that it will arouse your curiosity, and that it will prompt you to deepen your knowledge of astrology, as well as to visit and use the wide range of free applications at www.astrotheme.com.